Caius Antius C.f. 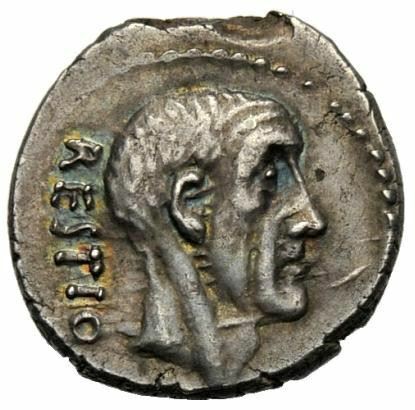 Restio was one of the moneyers for the year 47 BC. He was proscribed in 43 BC. Gens Antia was a plebeian family at Roman, which seems to have been of considerable antiquity. The first member of the gens to come to prominence was Spurius Antius, one of four ambassadors sent to Lars Tolumnius, the king of Veii in 438 BC. The family was not especially important during the Republic, but continued into the 3rd century, obtaining the consulship in AD 94 and 105. The Antii used the praenomina Spurius, Marcus, and Gaius. The cognomina of the gens Antia under the Republic were Briso and Restio. In imperial times we find Quadratus and Crescens.